Worksheet on joining numbers in math helps the kids to practice the preschool dot to dot worksheet for kids to join the dots in order from 1 to 50 to complete the picture. The fun way of learning numbers for homeschoolers, preschoolers and kindergarten kids by practicing this colorful worksheet to learn the numbers and their number order up to 50. Printable worksheet on dot to dot numbers helps the kids to join the dots in order with the help of pencil and then grab your favorite crayons or markers or water colors and enjoy coloring the sheet beautifully. Join the dots from 1 to 50 in sequence and complete the picture. Now color it. Parents and teachers can take the printouts of this worksheet on connecting numbers for kids to improve the hand-eye coordination in kids and help the kids to practice these worksheets. 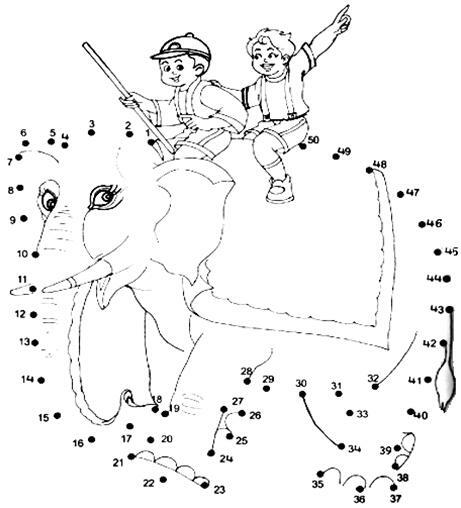 Take as many printouts you want so that kids can practice joining the dots and then enjoy coloring the sheets. This printable math counting activity on numbers from 1 to 50, for kids can be access by anyone from anywhere so that kids can have educational fun. ● Numbers and Counting up to 10. ● Numbers up to 10. ● Numbers 1 to 10. ● Count and Write Numbers. ● Count the Numbers and Match. ● Numbers and their Names. ● Numbers and Counting up to 20. ● Counting Eleven to Twenty with Numbers and Words. ● Counting Numbers from Twenty One to Thirty. ● Counting Numbers from Thirty One to Forty. ● Addition on a Number Line. ● Worksheet on Addition I. ● Worksheet on Addition II. ● Worksheet on Ordinal Numbers. ● Counting Numbers Practice Test. ● Worksheet on Counting Numbers 6 to 10. ● Worksheet on Kindergarten Addition. ● Kindergarten Addition up to 5. ● Worksheets on Kindergarten Addition up to 5. ● Before and After Counting Worksheet up to 10. ● Worksheets on Counting Before and After. ● Before, After and Between Numbers Worksheet up to 10. ● Worksheet on Before, After and Between Numbers. ● Counting Before, After and Between Numbers up to 10. ● The Story about Seasons. ● Color by Number Worksheets. ● Worksheet on Joining Numbers. ● Worksheet on Before, After and Between Numbers up to 20. ● Worksheet on Before, After and Between Numbers up to 50.